A road has been closed in both directions after a serious two-car crash. 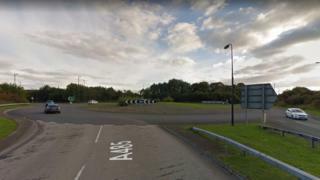 The A40 in Carmarthenshire has been shut between the Abergwili roundabout and Nantgaredig. The crash happened where the A485 joins the A40, at about midday on Friday. An air ambulance and fire crews were sent to the scene. Traffic between Carmarthen and Llandeilo is affected, with drivers asked to find alternative routes.